User name ... is invalid, can only contain letters or digits. Replace all of the old solution name with the new one. Navigate to Properties under each project and change the Assembly Name and Default Namespace fields to new solution name. Go to solution folder and rename all project folders with the new solution name. Remove all files under bin and obj folders. Solution will not be able to load projects. Remove all projects and add them again. Whilst deploying my newly upgraded ASP.NET MVC 3 web application to the production environment I started receiving a FileNotFoundException with the error message "Could not load file or assembly 'System.Web.WebPages.Razor, Version=1.0.0.0, Culture=neutral, PublicKeyToken=31bf3856ad364e35' or one of its dependencies. The system cannot find the file specified." I have encountered this before so I know it is about bin-deploying that assembly. But where is the System.Web.WebPages.Razor assembly? Since you have installed ASP.NET MVC 3 on your development machine you have all these MVC 3 assemblies installed in your GAC. Your production machine does not! So you need to find this file and make it bin deployable however this cheeky assembly isn't in you solution so how can you do that? Well... add it. Go to Add Reference on your root web project (e.g. 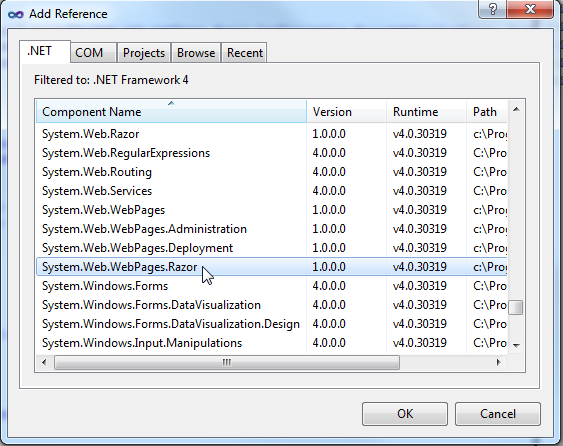 Web.csproj) and find System.Web.WebPages.Razor and add. Now right click this assembly in your references directory and click properties.